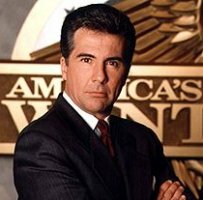 John Walsh (born December 26, 1945 in Auburn, New York) is the host of the program America's Most Wanted. Walsh is well-known for his extraordinarily low opinion of criminals. He usually appears wearing a black leather coat, which has become his signature style. In the summer of 1981, Walsh was a partner in a hotel management company in Hollywood, Florida. He and his wife, Reve, had a six-year-old son, Adam. On July 27, 1981, Adam was abducted. His severed head was later found in a nearby canal, although his body was never recovered. The prime suspect in Adam's abduction and murder, Ottis Toole, was never charged in the Adam Walsh case. He died in prison while serving life for other crimes. It wasn't long after Adam's death that the Walsh family turned their grief into action, helping missing and exploited children. Against bureaucratic and legislative problems, John and Reve's efforts eventually led to the creation of the Missing Children Act of 1982 and the Missing Children's Assistance Act of 1984. Subsequently, they founded the Adam Walsh Child Resource Center, a non-profit organization dedicated to legislative reform. Recently, the centers, originally located in West Palm Beach, Florida; Columbia, South Carolina; Orange County, California; and Rochester, New York; merged with the National Center for Missing and Exploited Children (NCMEC), where John Walsh serves on the Board of Directors. Today, Walsh continues to testify before Congress and state legislatures on crime, missing children and victims' rights issues. His latest efforts include lobbying for a Constitutional amendment for victims' rights.